Edward Robinson has worked as Military History Advisor for two Documentary Films for Tim Gray Media of Rhode Island. "D-Day: The Price of Freedom"
The following two articles appeared in the Providence Journal in Rhode Island to try and track the family a serviceman who had been killed in the fighting of July of 1944. Private Thomas James had scratched his serial number onto the bottom of his Army issue canteen, so when it was found in Normandy more than 65 years later it allowed his family to be traced to return this item to his daughter, Jean, then aged 75. Thomas James was killed on July 13th 1944 in a place that had earned the macabre Nick-name of 'Purple Heart Draw'. 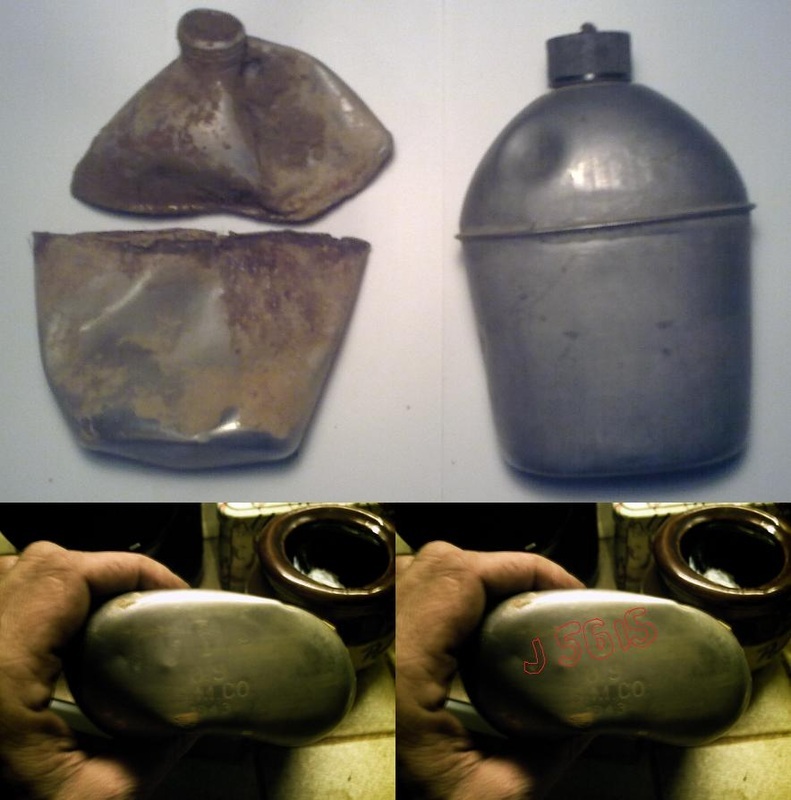 The photo at right shows the water bottle as found (top left) beside an intact bottle and also shows James' Serial number as it was scratched on the base (bottom left) and outlined in red (bottom right). The beach continues to give up its small pieces of history decades after the fighting. The metal rusts and breaks apart, the cloth fades and is reduced to ever smaller shreds. But the person who searches the sand with a fine eye for detail and a sense of historical connection can still find the well-worn piece of equipment that tells a story. Some of it is obviously part of something much bigger — a tank or artillery piece perhaps. And some of it is from the things a solider carried. Ed Robinson found the canteen while doing what he has been doing for years. He was walking the beaches in and around Normandy, where he conducts tours and sometimes shows American veterans the exact spot where they did amazing things in 1944. A few months ago, he found the canteen with his metal detector. It belonged to a guy from Newport. It was in two pieces and on the bottom piece, numbers and a letter were scratched into the metal: J 5615. The numbers were clearly part of a service number but not all of it. So Robinson did the kind of research he has learned to do. He studied battle maps and went to an Army Web site with the partial service number. He knew what unit — the 23rd Infantry Regiment of the 2nd Infantry Division — had fought in that area, and he worked on the assumption that the owner of the canteen had been killed in action. He found the full service number was 31445615 and the letter J was the first letter in the last name of Thomas James, who lived in Newport when he enlisted in October of 1943. James was 34 and married. He was a private. He is buried in grave 28, row 7, plot J in the American Cemetery in Colleville-sur-Mer in France. Tim Gray, who has produced fine documentaries on D-Day and Rhode Island veterans who took part, met Robinson when he was filming in Normandy. They have become friends and Robinson visited Gray in Rhode Island. So when Robinson determined the owner of the canteen, he asked Gray if he could help locate James’ family. Gray told him he knew this guy at the local paper. “Our desire is to see if [James] still has anybody here,” says Gray. “Eddie wants to see this canteen go back to the family. This is what they know from the archives Robinson explored via the Internet: James enlisted in the Army on Oct. 6, 1943, in Providence. He enlisted, as did everyone else, “for the duration of the war or other emergency, plus six months.” He died on July 13, 1944. He had completed one year of high school and worked as a salesman. Now, more than 55 years after James’s death, Robinson would like to bring something pulled from the sand in France back to the family of the man who carried it into battle. His Web site is BattleofNormandyTours.com. Jean Kerr cried some as she unwrapped the two battered pieces of metal. She didn’t expect tears. She wasn’t quite 11 back in 1944 when the telegram telling of her father’s death in Normandy arrived at the house in Newport. She thought her memories would remain firmly where they had always been. But there in her hands was the canteen her father had carried into battle in Normandy in 1944. It was all beat up and broken in two. But it was a solid connection to the very minute that he died. It was. Thomas James carried that canteen when he landed in Normandy and he carried it on July 13, 1944, when he was killed in fighting in a place too aptly called Purple Heart Draw. That it should end up in the living room of his daughter on Channing Street in Newport 66 years later is a wonderfully unlikely story that involves a Normandy tour guide, a Rhode Island filmmaker, an avid genealogist from Warwick and three people named Bob Kerr. “It’s one in a million that Ed could still read the serial number and trace it back,” said Tim Gray, who brought the canteen to Kerr Friday night. Gray is the middleman in this wonderful long-shot connection. He is a documentary filmmaker who has produced fine films about D-Day and the men who fought. One of them, “Navy Heroes of Normandy,” has been nominated for three New England Emmys. Gray has worked with Ed Robinson, an Irishman who is a tour guide in Normandy. Robinson, Gray says, is the best of the guides. He goes where others don’t. The two men have become friends. And when Robinson traced that canteen pulled from the Normandy sand back to Rhode Island, he knew who to call. Robinson found the canteen as he has found so many other bits and pieces of World War II — walking the beaches in and around Normandy with a metal detector. He traced it using the one initial and four digits of a service number scratched into the bottom — J 5615. He used battle maps and an Army Web site. He knew the unit, the 23rd Infantry Regiment of the 2nd Infantry Division that had fought in the area, and he worked on the assumption that the owner of the canteen had been killed in action. His research brought him to Thomas James, a 34-year-old private from Newport. He contacted Gray in the hope of finding family members. Gray contacted me. I wrote a column about the canteen two months ago. Evelyn Murray read the column at her home in Warwick. She thought what a sweet thing it would be if Thomas James’ canteen could be brought home to his family. So she got to work. “I’ve been doing genealogy since 1976,” she said. Murray checked a 1930 census. She used the Web site called Ancestry.com, went through Social Security death records and Providence Journal obituaries. She went from Thomas James to Jean Kerr. Jean Kerr’s late husband was Bob Kerr. Their son is Bob Kerr Jr. He’s the one who put down a box of tissues as Jean Kerr reacted to the contents of the package Gray brought to her house. Murray sent her information to Robinson. Robinson called Newport. On Friday night, Kerr passed the canteen around the large family circle that had settled in for the return of a different kind of heirloom. A picture of James in uniform and a copy of the letter from his commanding officer, saying that he was held in high regard by his fellow soldiers, were also passed from hand to hand. And there was the account of the battle that Robinson sent along with the canteen. His research is impressive. He has concluded that James died along the north wall of a house from which German machine gunners had been firing. The site is now a grassy field. James is buried in the American Cemetery in Colleville-sur-Mer in France. “It’s a beautiful spot,” said Kerr, who visited the cemetery in 1989. She remembers the small possessions of her father that were sent home from France — rosary beads, a prayer book, a letter she had written him. And now, there is this canteen, this war-scarred reminder of a family’s loss in World War II. Jean Kerr is not sure how she will display it or if perhaps she will just put it away in a safe place. She does know the delivery from Tim Gray on Friday has changed her a little. “It kind of brings everything back,” she said. Edward Robinson an Irish Tour Guide "A La Carte"
"I like the fact that the War is over and it can now be openly discussed from all points of view." From this was born the interest in Edward Robinson for the history of the Second World War, a bloody conflict that left room for reconcilliation between the warring nations. This has not been the case everywhere. "With a Catholic Irish mother and a Protestant English father there has been conflict in the house" this young Irish guide said with a hint humour. But then added on a more serious note "a lot of chapters in the Irish history book remain open to this day." Coming from Ireland, Edward Robinson set himself up in France following a chance meeting with a Frenchman from the Department of the Sarthe. Arriving into Cherbourg on visits to his friend he started to explore the D-Day Landing Beaches and also the First World War sites up to the Somme. "I never thought of becoming a Tour Guide until the day I was hired to do just that by the Caen Memorial Museum." That was in 2004. Since then, Edward Robinson has joined Normandy Sightseeing Tours based in Mosles in the Department of Calvados. This tour company specialises in Private Guided Tours made up to the clients specifications. "Our clients go where they choose. Anywhere between the D-Day Beaches and the Chateaux in the Loire Valley, our guides will take you anywhere you want to go." explained Frederic Guerin, the company Director. The areas covered by Edward Robinson's tours is rather more specialised. Interested in Military History since his early childhood, he only takes tours to sites of battles and turns the conversation as easily to the Battle of the Chemin des Dames in the First World War or the Seige of Alisea by Julius Caesar as talking of the Normandy Landings. "The difficulty of history is that it is normally written by the victors. But every story has two sides. To get it right you have to also ask for the side of the story written by the vanquished"
Taking it to the point of political incorrectness without offending can be a bit of a juggling act. "I tell American tourists that their armies did not win World War Two because they were better soldiers than the Germans, but mainly because their armies were numerically superior and had more equipment" This point of view is accepted by most visitors and veterans, but not all. One took huge offense and wrote a letter of complaint. But it takes more than something like that to knock this young man off his stride, an ardent defender of real history who says he never reads fiction. Edward Robinson can remember one tour he gave very well. The group consisted of a veteran German Machine gunner from Omaha Beach, two American veterans and a Canadian Veteran. The veterans all got on well, but the wife of one of the veterans refused to be part of the group. The bitterness still remains in some. "It took me 15 years to find this job. But now I'm sure I'll be a tour guide for life!" The following article about D-Day Honey was written by Gary Lee Kraut for the online magazine "France Revisited", with the same article also published in the online Magazine "N4Normandy" The first 5 paragraphs are below. To read the whole article please click on the link. From Pegasus Bridge to Utah Beach, the Landing Zone of Normandy is prime territory for D-Day merchandising: coffee mugs, baseball caps, t-shirts, windbreakers, pens, placemats, posters, plates, toy hand grenades, squirt guns, and much more. But I’d imagine that very little, if any, of it is actually made in Normandy. So I was a bit wary when saw a jar of “D-Day Honey” for sale this summer at Bernard Lebrec’s apple farm in Englesqueville la Percée, a village between Pointe du Hoc and the American Cemetery. Had Bernard, whose farm I’d always enjoyed visiting for its authenticity, gone crass commercial? What could honey possibly have to do with D-Day? A lot, it turns out—far more than those baseball caps, placemats and squirt guns. First, Bernard reassured me that D-Day was apple blossom honey, made locally by a friend of his. So I bought a jar. Good stuff. In fact, I thought of writing this piece because I’ve nearly finished my jar of D-Day and, needing another to get me through the honey-in-my-tea days of winter, I found in fine print on the label the contact information of the beekeeper, Ed Robinson. Ed is an Irishman living in Cartigny l’Epinay, a village about 12 miles (20 kilometers) south of Omaha Beach. He moved to France eight years ago to learn French and, long interested in military history, soon got a job as a D-Day tour guide. After six years working for others, he created his own touring company, Battle of Normandy Tours. Like his interest in military history, Ed’s passion for beekeeping began at an early age. He says that he was about five when he developed a fascination with bees and even asked his mother then if he could have a hive. No, she told him, but he could have one when he was ten. And she kept her word! You can read the rest of this article at the link above. 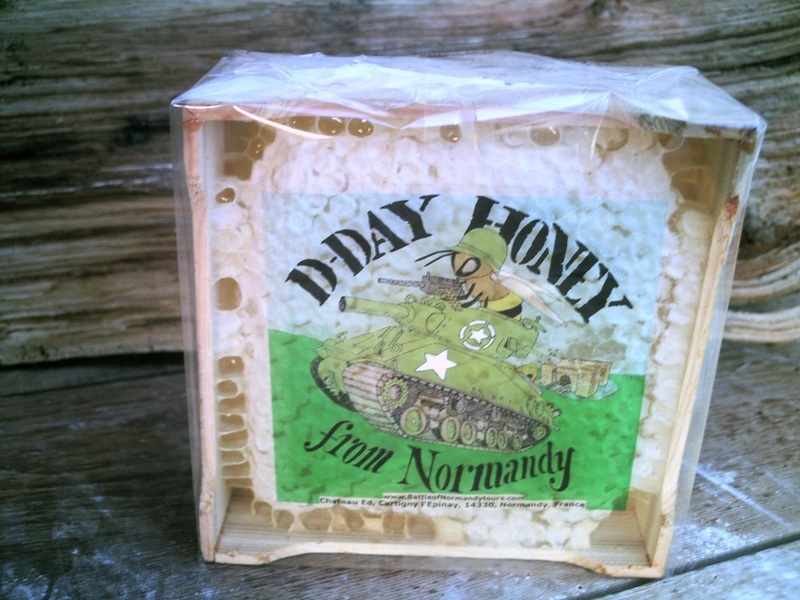 Ed Robinson and D-Day Honey: For more about Ed Robinson’s D-Day Honey and his Battle of Normandy Tours see www.BattleofNormandytours.com/honey.html. Bernard Lebrec: Bernard Lebrec’s apple farm produces juice, cidre, pommeau and Calvados. It’s located at Englesqueville la Percée on the main road between Pointe du Hoc and the American Cemetery. Tel. 02 31 22 70 72. E-mail b.lebrec@wanadoo.fr.